The Sarah Images on this page depict many important scenes from Sarah's life: her time in Egypt, her complicated relationship with Hagar and Ishmael, and finally her burial in the cave of Machpelah in Hebron. 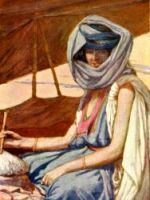 Sarah was the wife and half-sister of Abraham, and mother of Isaac. 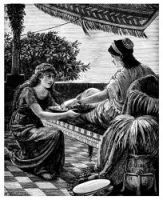 Her name is first introduced in Genesis as Sarai (my princess), but is changed by God to Sarah, (princess) at the same time that Abram's name was changed to Abraham. She died at the age of 127 years, twenty-eight years before her husband. 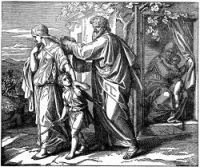 Abraham, who had apparently been away with his flocks, mourned for Sarah. From the friendly people of Hebron Abraham purchased enough land for a burial place for himself and his family to belong to his heirs forever. His purchase was a single field containing a little orchard surrounding a cave. This was all the ground that Abraham ever personally owned. Here in sadness and solemnity Sarah was laid to rest. These Sarah Images are from my collection of old Bible books. Feel free to use these Sarah Images in your artwork. Click on the Sarah Images below to see more details about saving a free picture of Sarah from the Bible or about purchasing the Sarah Images at a higher resolution.